Peter has looked at M-Audio’s new MidAir cable-free midi keyboard and adapter on CDMu, but I’d like to bring it up here for those who don’t visit the ‘Mu daily (shame!). The MidAir 37 controller is just an incremental upgrade on the existing MidAir 25, adding an extra octave and 9 faders. These are definitely interesting products, but without some way to strap them to your body they’re just removing a cable from the tangle behind your rig. Admirable, but not really worth US$100. 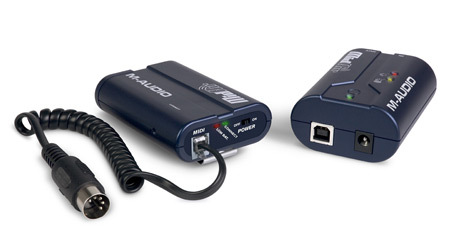 However, the MidAir Transmitter and Receiver system allows you to add wirelessness to your existing midi controller. The first thought to hit anyone’s brain when faced with this thing is “Yeah! Keytar!“. Don’t even try to deny it. Peter went there. Tom did. I certainly thought it, and that’s fine. Everybody was younger in the 80s, and given the chance we’d all go back there, if only to wait for the 90s to come around again so we could buy dot com shares and then pick up some cheap aeron chairs. Aside from the potential with DIY gadgets or hacked midi controllers, this device will allow visualists to integrate better with the musicians we collaborate with or support. I have a gig on Friday in which I’m providing visual tastiness for the whole gang, but shall be rocking the midi triggered visuals with Segue. This kind of thing is technically quite simple (midi out of MPD24 or MPC, into BCR2000, done), but logistically can be horrible. Tiny stages and often a lack of decent cable length from the projector can leave a VJ stranded on the opposite side of the dancefloor from their band. Fortunately Friday should be smooth sailing, but I think I’ll be getting a MidAir when they drop, if only for those gigs which can’t be guaranteed to run so smoothly. Update: The MidAir25 has been reviewed on O’Reilly Digital Media.